By all accounts CBOE's VXTYN Index has been a bust in terms of market participation. Currently the front month contract has zero volume, and zero open interest. This is where Triple 3 Partners, Australia-based hedge fund manager specializing in volatility trading, is hoping to step in. They have developed an alternative index YLDVOL (Bloomberg ticker YLDVUST) that i s supposed to better represent hedging and speculation needs of fixed income traders. YLDVOL has been developed under guidance of Dr Peter Carr from academic side, and in consultation with many fixed income traders. What traders complained about, is that CBOE just took their existing (admittedly very successful) VIX Index formula, and copied and pasted it to treasury market, ignoring specific differences between equities and FI. The differences are far from superficial - while equities volatility is typically quoted in %s, FI vol is quotes in basis points. This is really not just about the denominator, percent vol presumes geometric process (like geometric Brownian motion) while points vol presumes arithmetic process (like "regular" arithmetic Brownian motion). Therefore it would make sense that instead of VAR-Swap formula that is used for VIX index, YLDVOL would use Bachelier's implied vol. 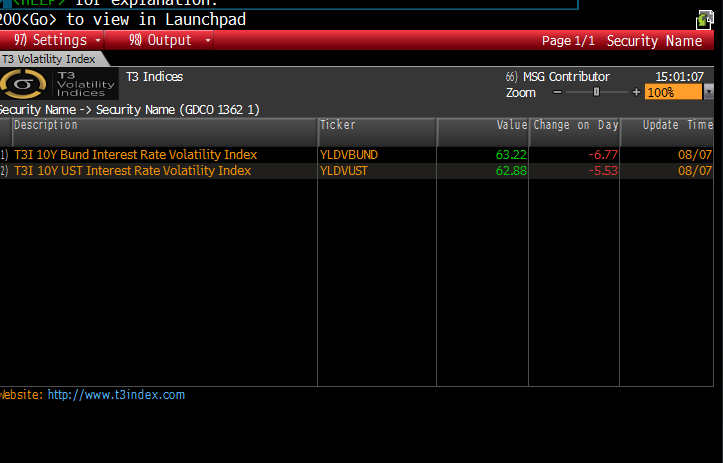 Just like the VIX, YLDVOL is interpolated to a constant 30-day maturity. Details on the index, and index calculations are available on t3index.com, and live values on Bloomberg using YLDVUST Index. 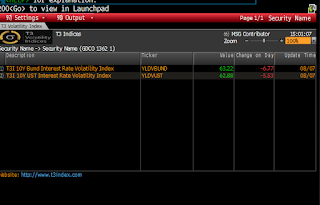 A look-alike index based on BUND with Bloomberg ticker YLDVBUND Index.